My column this month is less a reflective essay than a series of news and notes on the Presbytery’s life. Last summer I asked for help planning a party to celebrate the Presbytery’s fiftieth anniversary. Several of you have responded, and we have begun! We will remember God’s faithfulness over the past fifty years and look forward to the future God has for us. Time: Begins at 4:00 PM. Last August the Session of Irvine Presbyterian Church (IPC) withdrew from the process for dismissal to ECO. Since then the congregants have been deciding whether to stay with the property and in the PC(USA). Some have moved to a new location and established a new church. Others have remained. Those remaining are now pursuing creative options for IPC’s future. One option involves leasing space to Shepherd’s Grove Church, currently of Garden Grove. The church has about eight hundred people in worship and is seeking a better venue than the property they currently occupy. The lease’s practical benefits seem clear. Shepherd’s Grove is excited about the facilities and location on Alton Parkway. IPC would benefit from the monthly income. But their mutual excitement goes beyond practical convenience. Leaders from both congregations see in each other a similar spirit and complementary strengths. The two groups have discussed holding joint worship services and even ultimately merging. Those are larger questions, however, and the Presbytery may need to address them eventually. For now, we must review the proposed lease agreement. The Presbytery Council has appointed a three-person task group to meet with leaders from IPC and SGC and weigh the prospects for partnership. Please pray for the team’s work. They seek a solution that provides necessary rental income while protecting IPC from being overwhelmed by a much larger church. If discussions move briskly, the team will make recommendations to the Trustees on January 23 and to Council on January 25. Watch for updates from Council in late January or early February. Irvine is not the only congregation whose possible denominational future has changed recently. In late September, the Synod Permanent Judicial Commission (SPJC) upheld the Presbytery’s vote to rescind its dismissal of St. Paul’s Presbyterian Church of Anaheim to ECO. In early December, the SPJC set aside the Presbytery’s vote to dismiss La Habra Hills Presbyterian Church to ECO. Also in early December, the Session of Presbyterian Church of the Master of Mission Viejo notified me of their intent to withdraw from the dismissal process. 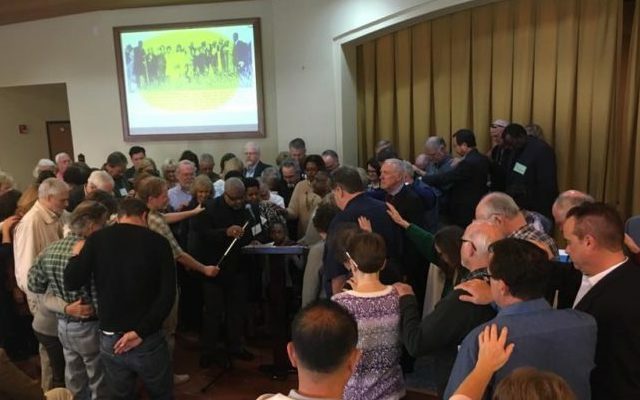 In short: Irvine, St. Paul’s, La Habra, and PCOM will all remain member congregations of Los Ranchos Presbytery for the indefinite future. I have tried to connect, at least a little, with these congregations over the fall. I have heard words of anger and resignation. They have seen their hopes disappointed. And they have voiced wariness toward both Los Ranchos institutions and people. But I have also heard words of resolve to move forward in ministry. They recognize that the mission of God is larger than a particular denominational affiliation. We are, then, at an important and delicate moment in our life together. Regardless of your position on dismissal, many of you carry hurt and anger from the past several years. But I also believe that you are committed to manifesting the Gospel in your lives. So I urge you: treat each other with patience and tenderness. Engage relationally as well as institutionally. Make lunch dates. Invite each other to the pastors’ retreat—and then socialize together. Hold joint elder trainings and joint prayer meetings. Take the initiative with each other. Cross social and theological divides to demonstrate our oneness in Christ. As Paul says, “Welcome one another, therefore, just as Christ has welcomed you, for the glory of God” (Romans 15:7). For if we spend our energy attempting to “outdo one another in showing honor” after the model of Christ (Romans 12:10), we will have an excellent story to tell a watching world. May we find our way together into that good and pleasant life. According to the Book of Order, a lease is not valid without the presbytery’s permission if it either lasts for more than five years or applies to worship space (see G-4.0206b). The three people are Emmett Raitt from the Committee on Ministry, Lissa Smith from the Strategic Coordinating Team, and John Smithers from the Trustees.